It's time for Farley's latest Currently linky party! The tv is always on here at Casa Krazy. Currently, it's tuned to House Hunters International. Anyone else wonder how those folks can afford the homes on these shows? I bought myself a new iPad mini. It is so cute! Spring Break cannot get here soon enough. We have an early dismissal on Friday, and I am hoping I (and the students!) make it unscathed. The reason I am wanting Spring Break? Those sassy kids! I am going to Vegas during Spring Break to cheer on my UTSA Lady Roadrunners basketball team in their conference tournament. And to sightsee. And gamble a little. And shop. And see a show or two. Edited to add that I am going to Vegas with Farley's mama and daddy! Her whole family is fab! I like sleeping in on Saturdays, I love sarcasm, and I hate stupidity. Use some common sense, people! Now go check out everyone else who linked up here! YAY you made it into the top 10... HOLLA!!! spring break cannot come soon enough!!! I would say lets hang out... BUT... I guess not!!! jeally of you and mama's trip to vegas!!! Some sassy students to hush- haha! Love it! Your blog is so cute- glad I found you! We must be sisters from another life... I like sleeping in, I LOVE sarcasm, and I hate stupid! Stupid people drive me cray cray!!!!!!!!! I laughed out loud when I read yours. I wrote that I hated my clock. That darn alarm just makes me grumpy. Here's to sleeping in all spring break! Woot woot!! Vegas!!!! Have a blast! I'm so glad you wrote you love sarcasm - because if you would have hated it, that would be sad! :) Happy to have found your blog here and to be a new follower! Thanks for stopping by our blog! Yay, I see you are also a 4th grade teacher! Us too!! 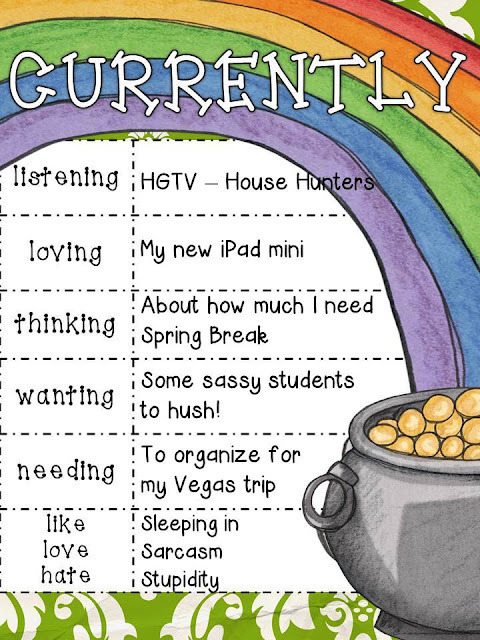 I love finding blogs from 4th grade teachers- it's fun to connect!! Yay! Another fellow fourthie!!! I also love sarcasm- it's my favorite second language. :) I found you through Farley and I'm your newest follower! I clicked on your blog from the Currently linky - just because I loved the name of it! I love sarcasm - excepte when it comes out of the mouth of my own children! Sassy children driving you kray, kray? I can soooo identify. My fourth and fifth graders got a taste of spring break from all of our snowdays. Now spring break cannot get here soon enough! Have a blast in Vegas!! My fourth graders have become very chatty lately also. I need to make a new plan for them next week. You had me at sarcasm. It truly is the little things in life :) Good luck with those students next week. Glad I found you! Agree! My brother describes some people as having uncommon sense! Have a great week off for Spring Break! You and I have a lot in common! I love sleeping in and can be quite sarcastic. I like to call it being facetious. lol And I am totally with you as far as not liking stupidity. I'm your newest follower--please feel free to stop by if you get a chance!